We have been instructed by one of our clients to offer for sale this Pell drummer boy automaton known as "Gwilliam". 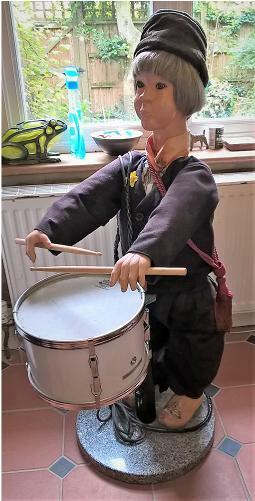 We understand that this drummer boy was originally custom made by Alan Pell Music to accompany the Pell organ known as "The Duchess". The drummer automaton was eventually sold to the present owner who used it in his home for entertainment. Whilst this unit was originally designed to run from a Pell organ it should be possible to modify it to operate from another instrument or as a solo automaton perhaps for display purposes. This could be used for display in a collection, or used with an organ again. The figure is sold as seen and it will be the new owner's responsibility to alter it as required at extra cost. Once working we can imagine this could be a wonderful addition and talking point in a collection. A rare opportunity as Alan did not produce many of this type of automaton; hence you could have in your collection a piece of Alan Pell history. The asking price is £750.00 (Sterling) o.n.o. Ex England. Please contact us in confidence to discuss further details or the purchase of this item. Contact: - Richard Dean 01275 834474 or email.